Without doubt caving (potholing (UK) / spelunking (USA)) around Davao is one of the highlights of any Philippines adventure travel vacation. Whether for one day or a whole week, caving Davao tour packages will enrich your senses and empower you to consider the wondrous power of Nature, when it is given time to create something unique. 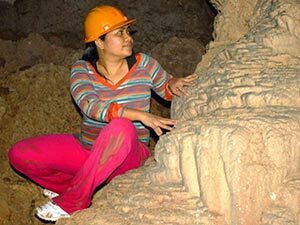 Two hours North of Davao in the foothills of Davao del Norte, are the limestone caves that Mother Nature has spent a thousands of years creating just for you. New Corella, Kapalong and San Isidro are the names of places you will come to know well and to share with your friends about on Facebook. Travel Davao will take you on this adventure and kit you out with all the gear you will need, all we ask is that you bring with you a pair of stout walking shoes that you don't mind getting muddy and wet. There are approximately 300 known caves within the area and it would take you a month just to visit the ones that have been mapped. Each cave is a unique experience and Travel Davao will package a selection of caves for your tour that most closely match your level of experience and areas of interest. Most of the Davao caves are wet caves, which means that the cave floors have trickles or streams or, sometimes, rivers running through them . . . in some caves you have to pass under waterfalls or jump into pools and almost everywhere there are drips falling from spectacular stalactites above. One cave, the canyons, actually has a small lake within and you will have to swim through the lake to reach the waterfall, to appreciate all of its wonders. Minimum age for all caving tours is 14 years old. 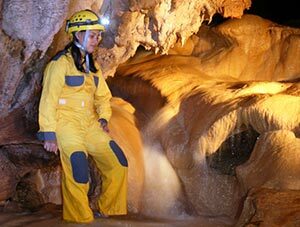 Caving Davao tour packages take at least one day; we offer one, two and three days caving adventure tours. If you choose to go caving for more than one day, you have the choice of camping or staying in standard hotel accommodation. Note: there is no deluxe or five-star accommodation near the caves. 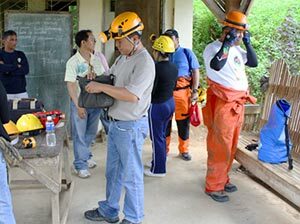 Caving Davao tour packages include: the transport from Davao City, to and from the chosen caving area; rental of caving equipment, such as lights, helmets and coveralls; hiring experienced caving guides; and, food & plenty of water. Accommodation is also provided either, camping or, standard hotel - all accommodations assume twin-sharing. 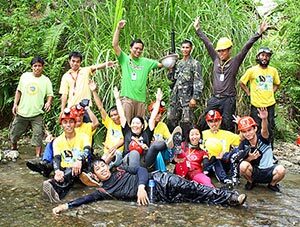 All caving tours depart Davao City at 7.00am and aim to return to Davao City by 7pm on the day of return; 8pm return to Davao City for the one day caving tour. Experienced cave guides are supplied in numbers to suit the size of your caving group. Cave guides are required to accompany all groups for all caving adventures around Davao, so that you will be sure to see the best parts of each cave and come to understand the cave formations and the animals, birds and critters that live within. All the cave guides are provided by the local communities in which the caves are found, although cave guides are paid a “guide fee” every time someone goes caving, you might want to give them something extra if you feel they have been particularly helpful during your visit.